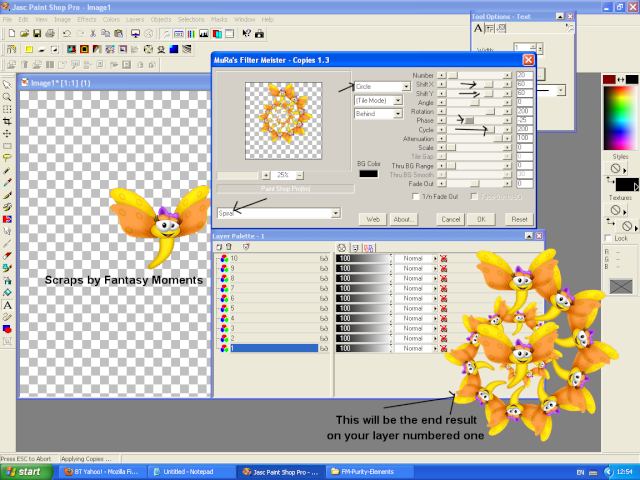 This tutorial was written by me Tilly, March 13th 2011, any resemblance to other tutorials are purely coincidental.. Here is my finished example of what we will be doing (Just a tip!! you may notice a white surround round the butterfly, when saving any png in animation shop it will not keep the entire transparency, so its best to save as an .mng and use it later).. 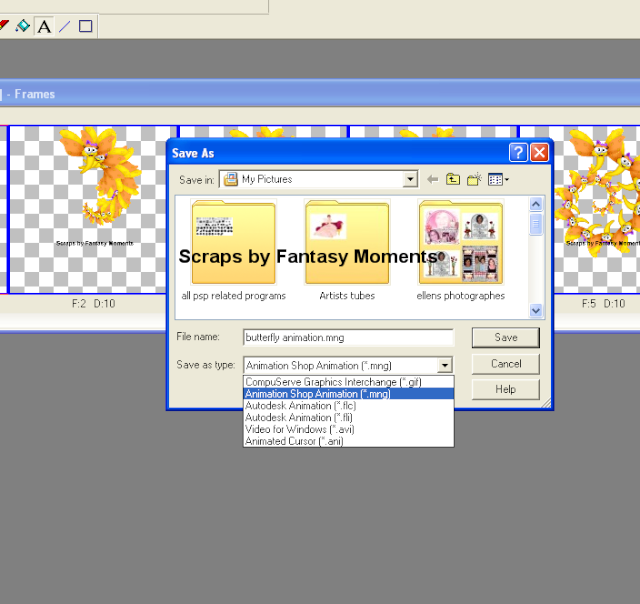 But alas geocites closed so i have downloaded them and zipped it up incase you don't have them..
Open the zip and add the mmcopies 8bf file to your plugin folder in psp. it also includes a notepad document with copyright information to Mura..
You will also need an element from a scrapkit, a preset shape you have coloured and sized to your liking or an image from a dingbat font of your choice..I'm going to use a butterfly element from a scrapkit by fantasy Moments, its in her purity kit found at this link. Open psp and create a new layer size as you like, but mine is 550x550 for the benefit of this tut..
or use a dingbat font, if using a dingbat font colour of choice and once completed make sure you promote the dingbat to a layer! 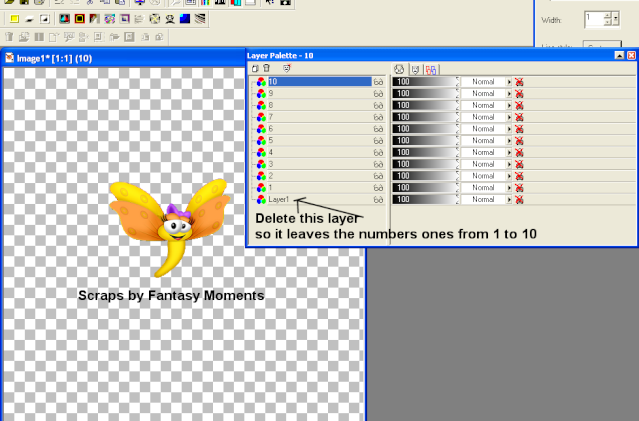 resize the element or dingbat if needed as it is best to be no bigger than 150x150 avatar size..
You will need to duplicate this image 10 times and rename each layer 1, 2, 3, 4, 5, 6,7,8,9,10 You can now delete the bottom ''layer1'' so in your layer palette you just have 10 layers.. See my screen shot 1..
Now we begin the Mura Copies part..
You will need to adjust only the following settings to start with. Shift X and Y so the image can be centred more, use those that work best for you and in my screen shot you will see mine are set to 60, yours will depend on the image itself just fiddle alittle to your taste, you may also change the phase if you wish mine is set to -25 and the ''Cycle'' must be set to 200 as this setting is the only one we will be adjusting from now on.. When happy click ok..
see my screen shot 3. 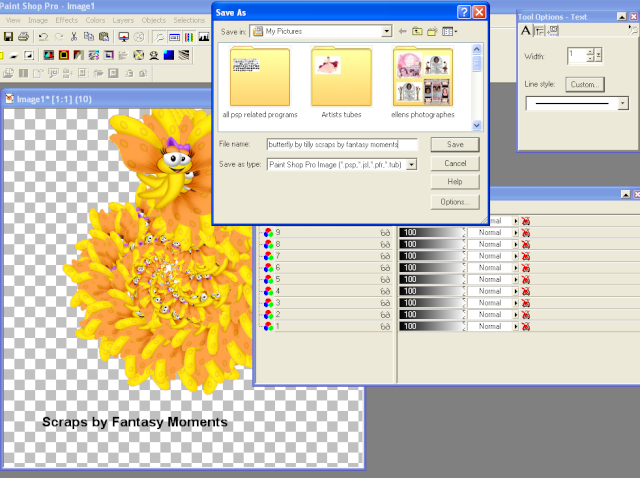 Step 3......... on your layer palette highlight layer numbered 3, click effects and mura copies and adjust the ''Cycle'' setting to 160, click ok..
layer 4 will be Cycle setting 140, layer 5 will be Cycle setting 120, Layer 6 will be Cycle setting 100, layer 7 will be Cycle setting 80, layer 8 will be Cycle setting 60, layer 9 will be Cycle setting 40 and finally layer 10 will be Cycle setting 20..
when you have completed all the mura stages, goto file and save this as a psp image, give it a suitable file name so you can find it. 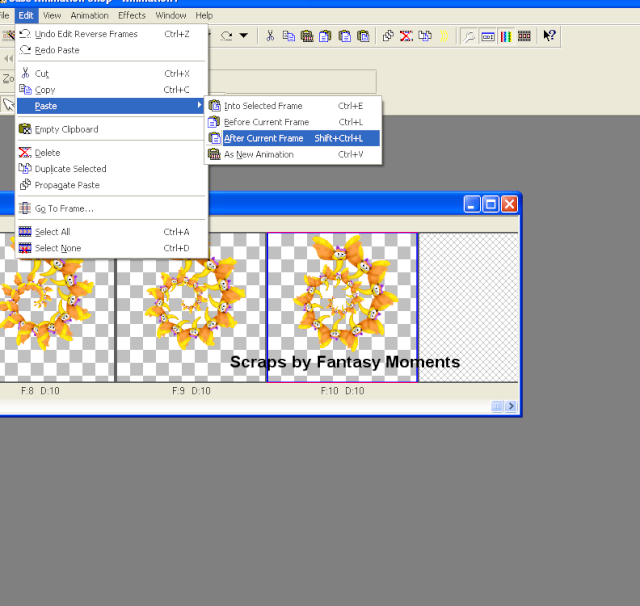 see screen shot 5..
Now open animation shop and goto file and open and search for your psp image you just saved from psp and open this in animation shop. 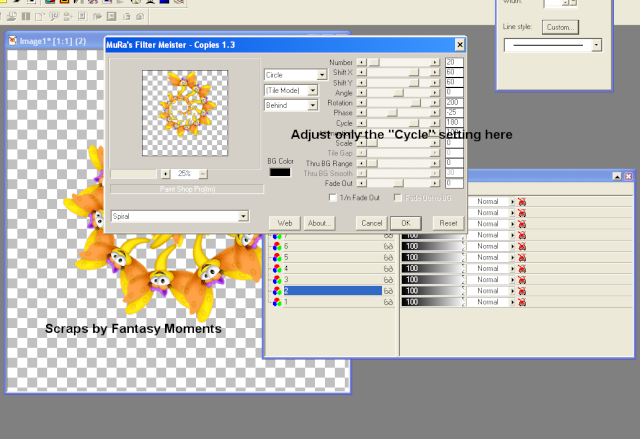 View the animation see my screen shot 6..
You will notice the animation only goes one way, we need to so some selecting all, copying and pasting, reversing frames and culling if needed..
step 1 goto edit select all, edit copy, and edit paste as a new animation. 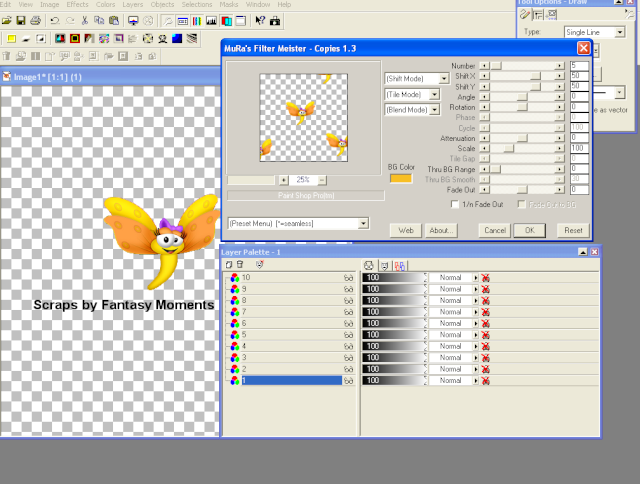 step2... on this new animation goto edit select all and then animation and reverse frames, back to edit copy and highlight frame 10 on your orignal animation and edit paste after current frame, this will give you a total of 20 frames. see screen shot 7.. 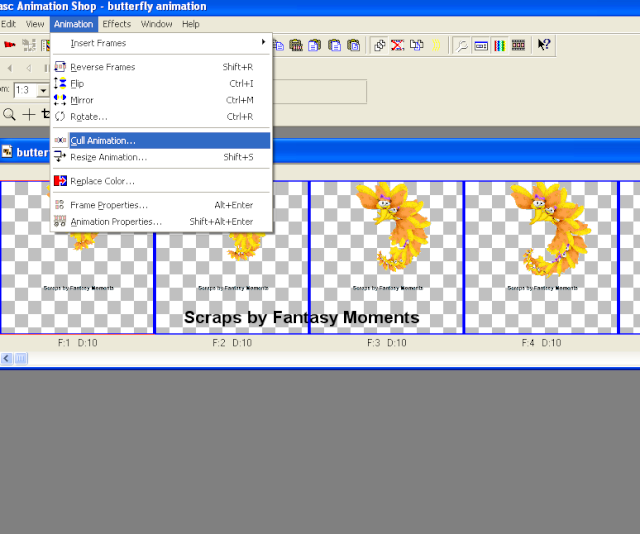 Step 3, goto edit making sure all frames are selected, copy, edit paste and paste this as a new animation. got to view your animation and it will be going to the right and then back up and to the left and back up..
Now you can leave this like this, or you can resize it to your tag, or you can cull it so it has less frames and less kb's..
to Resize make sure all frames are selected and resize animation to your liking, save as an .mng file to use at a later stage..
this way you will keep its transparency so it doesnt look odd and it will be ready for tags..
And thats all there is to it.. I'm working on the initial letters because the mura copies procedure needs extra steps, so the letter doesn't look backwards when mirroring.. 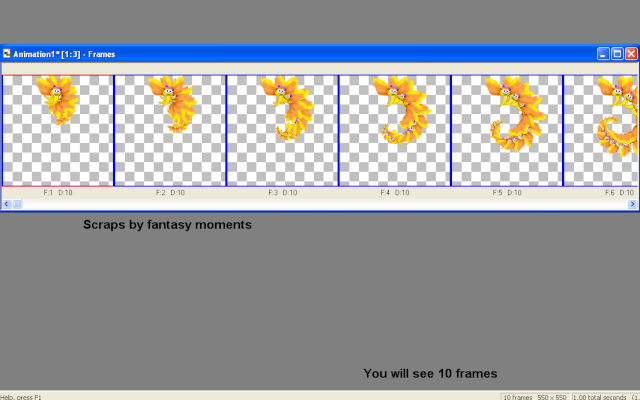 I have also realised after writing this that you could make 20 frames on the first new layer with an element or dingbat, and then do steps 1 to 4, on the first 10 frames, then reverse it on the next 20 frames save this as a psp image, and then open in animation shop select all copy and paste as new animation, mirror it and goto edit select all edit copy and highlight frame 20 on the original and paste after current frame, this will give you the 40 frames to start with and the animation should run exactly the same.. If you have any questions or get in a muddle please ask and i will help. 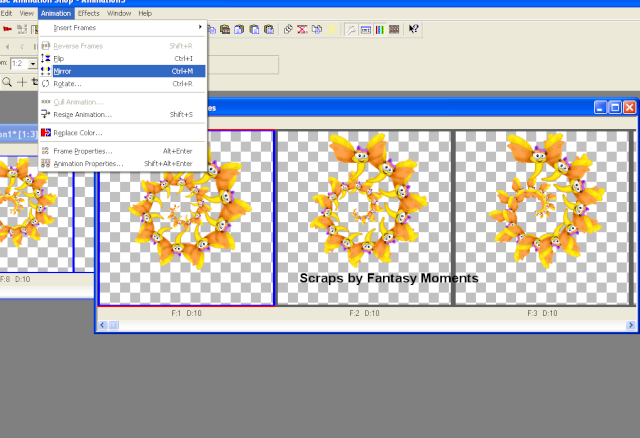 I have attached the zip of the entire tutorial, includes mura copies, screen shots and the text for the tut.